Baseball for Irish kids was a shortcut to the American dream and to self-indulgent glory and fortune. By the mid-1880s these young Irish men dominated the sport and popularized a style of play that was termed heady, daring, and spontaneous.... [Delahanty] personified the flamboyant, exciting spectator-favorite, the Casey-at-the-bat, Irish slugger. The handsome masculine athlete who is expected to live as large as he played. Four of Delahanty's brothers, Frank, Jim, Joe, and Tom, also spent time in the major leagues. Delahanty attended Cleveland's Central High School and went on to college at St. Joseph's. He signed on to first play professional baseball with Mansfield of the Ohio State League in 1887. Delahanty also played minor league ball in Wheeling, West Virginia. 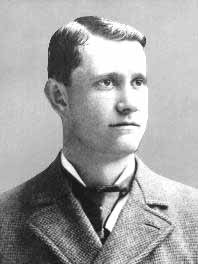 In 1887, the Wheeling team sold Delahanty to the Philadelphia Phillies for $1,900. He became the most prominent member of the largest group of siblings ever to play in the major leagues: brothers Frank, Jim, Joe and Tom also spent time in the majors. The Phillies obtained Delahanty as a replacement for Charlie Ferguson. Ferguson was a pitcher who had converted to second base for his final season, but he died early in 1888 from typhoid fever. Delahanty was brought in to fill in for him at second base. He began his career on May 22, 1888, with the Philadelphia Phillies in the National League (NL), playing 74 games that season with a .228 average, 1 HR, and 31 RBI. The next year, in 56 games, he raised his average to .293. In 1890, he jumped to the Players' League (PL), but returned to the Phillies the next year when that league folded. He hit .306 and tallied 6 HR and 91 RBI in 1892. During one game that season, St. Louis infielder George Pinkney charged toward home plate, expecting Delahanty to bunt; Delahanty swung and hit a ball that "appeared to have been shot from a cannon", breaking Pinkney's ankle. That same year, Delahanty was the victim behind one of "The Most Shameful Home Runs of All Time", according to authors Bruce Nash and Allan Zullo. When Delahanty's Phillies hosted the Chicago White Stockings at Philadelphia's Huntingdon Street Grounds in July, Cap Anson hit a fly ball to center field. The ball hit a pole and landed right in the "doghouse", a little-known feature of the park that was used to store numbers for the manually run scoreboard. Delahanty tried reaching over the "doghouse" and then tried crawling down into it. He got stuck, and by the time teammate Sam Thompson had freed Delahanty from the area, Anson had crossed home plate. Delahanty blossomed in 1893 with a .368 average, 19 home runs, and 146 RBI. He narrowly missed the Triple Crown, as teammates Billy Hamilton and Sam Thompson led the league in batting with .380 and .370 averages respectively. While with the Phillies, Delahanty played under manager Harry Wright, the man who assembled, managed, and played center field for baseball's first fully professional team, the 1869 Cincinnati Red Stockings. Wright managed the Phillies with Delahanty for four seasons, from 1890 to 1893, with the two and their fine supporting cast leading the Phils to "first division" finishes during those years, though the team never won a pennant. Between 1894 and 1896 Delahanty compiled astonishing batting marks: .407, 4 HR, 131 RBI; .404, 11 HR, 106 RBI; .397, 13 HR, 126 RBI. In 1894, despite his high average of .407, the batting title went to Hugh Duffy with a major league record-setting .440. The 1894 Phillies outfield had a big season, with all four players averaging over .400. That season, Delahanty hit .407, Sam Thompson batted .407, Billy Hamilton .404 and spare outfielder Tuck Turner finished second to Hugh Duffy in hitting at .416. Delahanty won his first batting title in 1899 with a .410 batting average, adding nine homers and 137 RBI and becoming the first player in major league history to hit .400 three times. Delahanty was surrounded by talent in the Philadelphia outfield. Author Bill James wrote, "Any way you cut it, the Phillies had the greatest outfield of the 19th century." On July 13, 1896, Delahanty became the second player to hit four home runs in a game. He was the first player to do so in a losing effort. (The Phillies lost the game, 9–8.) Two of them were hit into the bleachers while the other two were inside-the-park. In 1899, Delahanty hit four doubles in the same game. He remains the only man with a four-homer game and a four-double game. The same year Delahanty collected hits in 10 consecutive at bats. He tallied six-hit games in 1890 and 1894. After switching to the new American League (AL) in 1902, playing for the Washington Senators, Delahanty won his second batting title with a .376 mark. To date, he is the only man to win a batting title in both the AL and NL. After the 1902 season, Delahanty commented to a reporter, "I know I am getting along in years and won't be able to last much longer in first-class baseball, therefore I am going to get all the money there is in sight... Last year I was playing with the Phillies for $3,000, this season the Washington Club gives me $4,000, and if I can get $5,000 no one can blame me for taking it." Delahanty returned to the Senators for the 1903 season. He was hitting .333 with one home run and 21 RBI in 42 games that year until the incident at Niagara Falls. Delahanty died when he was swept over Niagara Falls in early July 1903. He was apparently kicked off a train by the train's conductor for being drunk and disorderly. The conductor said Delahanty was brandishing a straight razor and threatening passengers after he consumed five whiskies. After being kicked off the train, Delahanty started his way across the International Railway Bridge connecting Buffalo, New York with Fort Erie (near Niagara Falls) and fell or jumped off the bridge (some accounts say Ed was yelling about death that night). Whether "Big Ed" died from his plunge over the Falls or drowned on the way to the Falls is uncertain. His body was found at the bottom of Niagara Falls two weeks after his death. A study of the tragedy appeared with the publication of July 2, 1903: The Mysterious Death of Big Ed Delahanty, by Mike Sowell (New York, Toronto, MacMillan Publishing Co., 1992). Sowell presents the evidence of a drunken accident, suicide, and even possibly a robbery-murder (there were reports of a mysterious man following Delahanty). In his 16 seasons with Philadelphia, Cleveland and Washington, Delahanty batted .346, with 101 HRs and 1464 RBIs, 522 doubles, 185 triples and 455 stolen bases. He also led the league in slugging average and runs batted in three times each, and batted over .400 three times (1894-1895, 1899). Rogers Hornsby is the only other three-time .400-hitter in National League history (1922, 1924–25). Delahanty's lifetime batting average of .346 ranks fifth all-time behind Ty Cobb (.366), Rogers Hornsby (.359), Joe Jackson (.356), and Lefty O'Doul (.349). There is a sports bar in Phillipsburg, New Jersey, Delahanty's Tavern On The Square, named in his memory. His photograph and life story line the walls and menus inside. In 2008, he was memorialized by the band The Baseball Project on their album, Volume 1: Frozen Ropes and Dying Quails. The song, "The Death of Big Ed Delahanty", is a driving, punk-influenced ballad. The Hamburg Marines, a German Baseball Club, named their ballpark in the Hamburg quarter Billwerder after Ed Delahanty. ^ a b c "Ed Delahanty Statistics and History". Baseball-Reference.com. Retrieved November 9, 2014. ^ "Lookink (sic) back to ye olden days on diamond". The Norwalk Hour. January 26, 1923. Retrieved November 9, 2014. ^ Grayson, Harry (June 16, 1943). "Ed Delahanty was right-handed Babe Ruth of Dead Ball Era". San Jose Evening News. Retrieved November 9, 2014. ^ James, Bill (2010). The New Bill James Historical Baseball Abstract. Simon & Schuster. p. 675. ISBN 1439106932. ^ "Delahanty admits that he is out for coin". The Pittsburgh Press. December 5, 1902. Retrieved November 9, 2014. ^ "Delehanty's (sic) body found". The New York Times. July 10, 1903. Retrieved March 9, 2014. ^ Niagara Blog, On this day in Niagara Falls History – July 2, 1903"
Casway, Jerrold (2004). Ed Delahanty in the Emerald Age of Baseball. University of Notre Dame Press. ISBN 0-268-02291-7. Wikimedia Commons has media related to Ed Delahanty. This page was last edited on 29 December 2018, at 19:32 (UTC).